On the night before He offered His life on the Cross for the salvation of the world, Jesus “took the bread, said the blessing, broke it, and gave it to them, saying, ‘This is my body, which will be given for you; do this in memory of me.’ And likewise the cup after they had eaten, saying, ‘This cup is the new covenant in my blood, which will be shed for you.’” (Luke 22: 19-20). We believe Jesus’ words! Under the appearance of bread and wine, our Lord continues to offer Himself as food for the world. The Sacrament of the Eucharist is Jesus’ Real Presence, Body, Blood, Soul, and Divinity. Jesus says that His flesh is true food and his blood is true drink (John 6:55). Many of his disciples were scandalized by this teaching and left him. 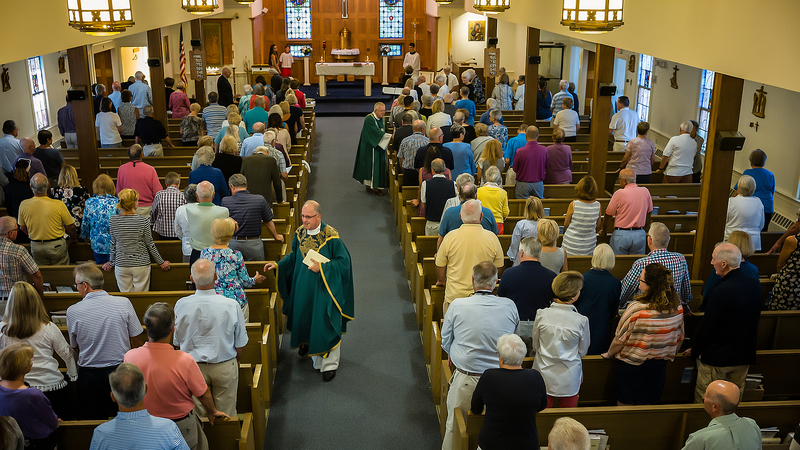 As Catholics we firmly believe that when we approach the altar for Holy Communion (the reception of the Holy Eucharist), we are encountering the Real Presence of Jesus. We echo the words of St. Peter, when he was confronted with this hard teaching, “Master, to whom shall we go? You have the words of eternal life. We have come to believe and are convinced that you are the Holy One of God” (John 6:68-69). Preparation for reception of First Holy Communion usually happens during our summer Faith Formation program before 2nd grade. The students and their families also attend three special classes during the school year. Baptized Catholic adults seeking First Holy Communion are to enroll in the RCIA (Rite of Christian Initiation for Adults) program. For more information click here.